This adventure clocks in at 22 pages, 1 page front cover, 1 page editorial, 1 page SRD, leaving us with 19 pages of content, so let’s take a look! So, there are a few setting assumptions here that should be mentioned: The book assumes a Dark Age, following the collapse of a magical empire, torn apart by the strife between orcs and dwarves, splitting the continent among racial lines; the economic depression following the collapse was quick and severe and, well, “Chaos reigns!” (If you got that reference, props to you!) 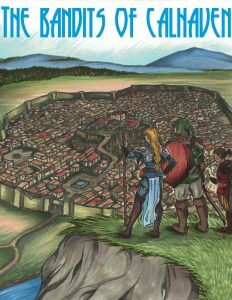 Anyways, the eponymous city of Calhaven was once a jewel of a place, but nowadays, it lies in ruins, occupied by various clans of lawless bandits; in the aftermath of its sacking and decline, the nearby village of Blackhorse, forced to function without the aid of the empire, has managed to assume a role as a small center of commerce. We begin this adventure with the PCs exploring Blackhorse, where you can find the usual places, but also a farmer’s market and a lodge of individuals seeking to reconnect with the empire. The village comes with a really nice b/w-artwork depicting it, but honestly, I wished we got a proper map instead. There is another component to be aware of: Blackhorse has a printing press AND a local newspaper. While I am not opposed to this concept per se, it does somewhat clash with my conceptions of a fantasy Dark Age, as, well, printing presses are an instrument for enlightenment. A printing press is one thing to explain away, but the presence of a local newspaper is slightly harder to stomach; it assumes general literacy, the resources available, the infrastructure to pay for it, etc. – in the aftermath of a society’s collapse, that stretches my imagination hard, even when I give the module the benefit of the doubt. Structure-wise, the module sports 3 random encounter tables and the NPC/monster-appendix in the back is pretty massive, providing stats for named characters, including for the non-combatants. There are a couple of glitches in the statblocks, though, both regarding attack bonuses and formatting. Italicizations have not been implemented at all and the headers for actions/reactions are missing, which makes it harder than it should be to differentiate between active and passive abilities and read the statblocks. Considering that quite a few are taken from the MM, this is rather odd. If you’re one of the GMs who has trouble improvising read-aloud text, then you should be aware that this module does not offer the like. Anyways, this is as far as I can go without going into SPOILERS. Potential players should jump to the conclusion. All right, only GMs around? Great! After the PCs had a bit of time to familiarize themselves with Blackhorse, they are contacted by the local innkeeper Saul. His son Toby seems to have gone missing. Following the tracks through farmland to the forest, the PCs will encounter a brownbear, the boy’s blade lodged into the creature. There is no way presented in the module to not kill the bear. In the aftermath of the struggle, the PCs will note that there are signs of struggle, of course thus pointing to the eponymous bandits of Calhaven as culprits. Reaching the city’s massive walls, the PCs can find a shantytown (once more depicted with a really nice b/w-artwork)…which is empty, with murdered bandits all around. Their weapons are gone, though a few gold pieces may be secured by looting the bodies. Similarly, the gate is not manned by bandits…which does not bode well. There is an option to scale the walls as well. Walking through the ruins of the once grand city, the PCs will have to deal with a few random encounters before catching a conflict between bandits and skeletons + zombies. A peculiarity in presentation would be that monsters in a room are not bolded, highlighted r mentioned separately, requiring that you read the flavor-text to determine their number. This may not be problematic for most GMs, but it represents a comfort-detriment and makes it harder to run on the fly. It’s a needless downside. Here would be as well a place as any to mention that the module sometimes alternates between the third and second person, and numbers are similarly somewhat inconsistent. It should also be noted that there is no map for the city’s ruins. Presumably, the PCs save the bandits and are thus led to the base of the bandit Kendra – who turns out to be the mother of the errant Inn keeper’s boy; turns out that his dad had a hidden bandit past. The young fellow wants to stay with his mother, his bravado against the growing undead threat a façade. Kendra asks the PCs to assault the imperial center, the apparent source of the relentless undead that have begun plaguing the city. A nice, hand-drawn b/w map of the complex is provided, though, annoyingly, we don’t get a player-friendly, key-less version. The map also sports no grid, but at least has a scale included. It is here that we change gears towards a more traditional “dungeon” exploration, as the PCs sift through the ruins of old. The couple of rooms are pretty solid and relatively interesting, with e.g. a magical, recycling toilet as an interesting component. That being said, there are a couple of unnecessary hiccups in the details – multiple instances of untyped damage that should be e.g. poison damage, Arcana misspelled as Arcane…you get the idea. The glitches are cosmetic, but they do accumulate. Ultimately, the PCs find a remnant of a Gate-network, one that was activated: On the other side, a massive army of undead, lead by a lich, is preparing to march through, so they should close the gate, pronto. Somewhat weird: The closing process requires “full concentration”, which isn’t really a rules term in 5e; concentration. It should also be noted that the character in question attempting to close the gate must remain on the dias, which makes the task less easy than you’d think. Slightly odd to me would be that the gate doesn’t have a damage threshold. The pdf notes on how to proceed with the consequences of the gate network, though, imho, that aspect should have been noted from the start. Even a partially functional gate network is a pretty damn big deal and while the GM can explain that away, it’s still something that not everyone wants in their games. Editing and formatting are okay; I noticed more minor glitches than I expected at this brevity, several of which pertain minor aspects of the rules-language. A few of them can be ignored, but here, we have too many. The issues with the formatting are annoying – non-italicized spells, the lack of subheaders in the statblocks, creatures not bolded in the text, etc. make this module significantly less convenient than it should be. Layout adheres to a no-frills two-column b/w-standard. The highlight of the book would be the b/w-artworks of the environments; the one full-color artwork of an evil knight before a horde of the dead felt cheesy to me. The map of the dungeon is solid, but the lack of a player-friendly map is annoying. The lack of maps for the settlements also makes them more opaque than they should be. The pdf does not have any bookmarks, another strike against the module. Marshall Lemon’s “Bandits of Calhaven” is per se a decent adventure. The setting hinted at here and there is interesting. Yeah, sorry, that’s about the only thing I liked about this adventure. The monsters are painfully standard fare and bland; the module per se constitutes a series of combat encounters that didn’t do anything for me, courtesy of the lack of interesting terrain features, maps or unique tricks at the beck and call of the critters. While the adventure has a few scenes where it manages to generate a bit of atmosphere, even that is not really used well: Exploring the shantytown with all the dead, exploring the ruins, should be scenes where tension is vamped up, where paranoia is generated. Here, they just flow. Nothing really exciting happens. The finale is also pretty anticlimactic – if the GM plays the foes smart and the PCs are unlucky, they may well be wiped out, courtesy of a single PC’s botched concentration rolls, all while the rest of the party slogs through the foes emerging. The behavior of the opponents makes also no sense in that encounter. Why not send a properly powerful commander through first? Anyways, even if I take all of that into account, you could argue that the module is at least decent. However, this adventure is incredibly inconvenient; more so than Geoffrey McKinney’s self-published wall-of-text AD&D-hexcrawls. The formatting deviations are inconvenient and the lack of maps and bookmarks add further strikes against the module. Which leaves me with precious few positive things to comment on. While the publisher is relatively new, there are plenty of publishers that manage to get all of these things right…and more. Even if I only compare this to other 5e-modules, it falls flat of the formal standards and its simply not interesting enough to make up for these shortcomings. There is one positive aspect to this module, namely that, as per the writing of this review, it is available for a single buck. That is fair for the nice b/w-artworks…but then again, I know a ton of better, free adventures. I try hard to find the positives about an adventure, but here, I don’t have much to praise. Considering the vast amount of superior offerings out there, I can’t go higher than 1.5 stars…and honestly, I can’t find it in me to round up. You can get the adventure here on OBS.